Like several architectural firms at the end of the 19th century Schneider & Herter sometimes operated as its own real estate brokers. Such was that case when architects Ernest W. Schneider and Henry Herter joined forces with John Fish and Eugene Schultz to form Schneider & Co. The development firm had a built-in design team in Schneider & Herter. 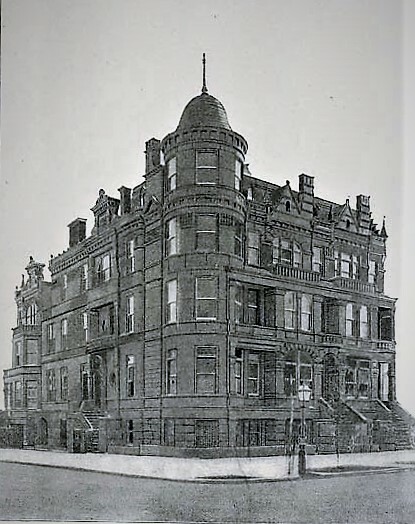 The alliance began construction of a grouping of four upscale homes at the southeast corner of West End Avenue and 102nd Street in May 1892. By now the Upper West Side's architectural personality had taken shape. Sparked by the imaginative minds of architects like Clarence True and Rafael Guastavino, blocks of delightful, picturesque houses sprouted gargoyles, turrets and dog-legged stoops. They stood in stark contrast to the more regimented, traditional rowhouses elsewhere in the city. Schneider & Herter joined the trend with gusto. Three of the four houses, Nos. 854 through 858 West End Avenue pretended at first glance to be a single massive mansion. No. 254 West 102nd Street, around the corner, not only stood on its own architecturally, but was slightly separated from the corner house by what the Real Estate Record & Builders' Guide described as a "yard running from front to rear." That arrangement gave both houses an additional wall of windows and light. The West End Avenue houses have lost their stoops. The entrance to the corner mansion survives on the side. Construction of the Queen Anne-style houses was completed in April 1893. The two 17-foot wide houses at Nos. 854 and 856 West End Avenue were near copies inside and out. Above high dog-legged stone stoops with newels carved with lions' heads, their entrances were deeply recessed. At the parlor and third floor levels of No. 856 the architects added chunky Romanesque Revival arches. Colorful stained glass filled the transoms of the parlor windows. Both houses terminated in an attic floor brimming with Flemish Renaissance touches, a nod to the city's Dutch roots and a favorite motif along the Upper West Side. Stealing the spotlight was the corner house, No. 858 West End Avenue. Despite its address, its entrance was centered in the 72-foot long 102nd Street side. A corner tower dominated the design and provided an additional full-height corner room. It bell-shaped cap, often referred to as a pepper-pot, culminated in a tall, decorative finial. The step-sister of the group, No. 254 West 102nd Street, rose in stepped, angled bays like a wedding cake. Its third floor was distinguished by a single Romanesque Revival arch that not only provided a flood of sunlight inside, but access to the ample balcony. The sparse development of the immediate area was reflected in the Record & Guide's mention that the projecting bays of No. 254 "overlook the River and Palisades." Atop the cornice rose an ornate, quirky pediment perhaps more expected on a 23rd Street store. The abundant balconies throughout the group was noteworthy and innovative. In describing the second floor balcony off a bedroom of the corner house, a critic noted it "may be occupied on a summer's morning or evening, and from which a good view of the Hudson River and Palisades is obtained. This method of utilizing the balcony should be more generally adopted." Schneider & Co. lavished the interiors with expensive materials and amenities. All were trimmed in hardwoods and the fireplace mantels were faced either in onyx or marble. The Record & Guide noted "They have openings of fret-work in horse-shoe shape to divide the music-rooms from the parlors and some of the bedrooms above." The tiled-floor bathrooms had seven-foot high tile wainscoting and nickel-plated fixtures on the porcelain tubs and sinks. Within the corner house, the parlor level consisted of "a reception room, with windows overlooking the avenue and street, and with a mantel, mirror and fireplace with Mexican onyx facings and tiles; a large dining-room with a similar mantel, including a sideboard, etc. ; a library and smoking room and a butler's pantry, with a new feature in the shape of a compartment for warming plates. One the same floor as the house is entered, there appears a vestibule, a foyer hall with a recess containing a terra cotta mantel and mirror, and two conversation seats." The second floor contained three bedrooms, two dressing "saloons" and a bath. There were four bedrooms and a bath on the third floor. The Record & Guide pointed out "the attic consists of a tower, for a children's nursery or lookout." In all of the houses, the basement level contained a billiard room with built in sideboards and handsome mantels, the kitchen, laundry, dumb water, and servants' rear stairs. Unfortunately for Schneider & Co., the expensive homes were completed at the onset of the Financial Panic of 1893--a serious economic depression that resulted in the closing of 500 banks and the failure of 15,000 businesses. While No. 856 sold that year, the remainder of the group sat vacant. Finally in 1895 the three unsold houses were divided among Schneider & Co. investors. Eventually, of course, the economy improved and one-by-one the residences were sold. No. 854 became home to attorney and sometimes architect Edward Miehling and wife, the former Pauline Eickhoff. Living with the couple was Pauline's parents. Anthony Eickhoff was the most interesting and accomplished among the family. Born in Lippstadt, Westphalia, he had fled to America during the German Revolution of 1846. After living in New Orleans for two years, he moved to St. Louis at the age of 21 where he founded the St. Louis Zeitung, and later became editor of Dubuque's The Nordwestliche Demokrat and then German-language newspaper in Louisville, Kentucky. After moving to New York in 1852 he became editor of Die Abendpost, then from 1854 to 1856 of the New Yorker Staats-Zeitung. He joined the Union Army and served as commissary-general for New York troops; was elected to the State Legislature in 1863; and in 1873 was appointed Coroner. Three years later he was elected to United States Congress. Eickhoff's amazing career was hardly over. From 1891 to 1896 he was Fire Commissioner. At the time the family moved into the West End Avenue house the elderly man was still active, serving as auditor for the Fire Department. He still managed to find the time to write a book on German immigration entitled The German in America. He died in the West End Avenue house in November 1901 at the age of 74, ending a brilliant and remarkable career. The Miehling family would continued to live in the house until December 1907 when it was sold to Israel Lebowitz, a real estate operator. He quickly sold it to Frederick W. Stephenson. Stephenson and his wife, Linda, had a daughter, also named Linda, and son, F. Kenneth. While Stephenson stayed home attending to business in the winter of 1914, his family went off to the fashionable Florida resort "colony" of Belleair. The Sun predicted "a lively and brilliant season at the hotel as well as among the cottage colony," that season and listed among "the earliest arrivals" the Stephensons. Daughter Linda was a young woman by now and later that year she bought a Chalmers automobile, a purchase that reflected the affluence of the family. The opening price for a 1914 Chalmers was $2,000, or around $49,500 today. It was the older Linda Stephenson who seems to have been the most socially and politically active in the family. Her name appeared in newspapers as she rallied for issues like the Prohibition. In August 1918 she was among the list of women who petitioned the governor to "take a definite and open stand for prohibition" and to emphasize "his opposition to the liquor traffic and the use of intoxicants." Above the brutalized basement level of No. 856, stained glass and other elements survive (including the entrance transom). Someone thought that painting the brownstone brown would be a good idea. In the meantime the other houses in the group were home to well-to-do families. Next door, No. 856 was home to the family of Solomon Katz, a dealer in laces at No. 19 West 21st Street. Although the family was not on a financial or social par with Fifth Avenue society, protocols were followed. On November 19, 1911, for instance, The New York Times society column noted "Miss Irene Katz...whose engagement to Normal L. Strauss of this city was announced several weeks ago, will be at home on Thanksgiving Day from 4 until 6." The massive corner house had a rocky beginning, owner-wise. In 1898 it was sold in foreclosure to J. Johnson. After he died just two years later owing $28,873 on the property (more than $850,000 today), it was operated as an upscale boarding house for a few years. Among the well-heeled boarders living here prior to 1908 were W. A. Boyd, secretary of the Chicago-based McLeod Company; Colonel F. C. Loveland and his wife; and Margaret A. Klein, originally from Walterboro, South Carolina and head of The Educational Alliance. In November 1908 No. 858 finally got a long-term owner in Frederick Bertuch and his wife, Minnie. Bertuch, who was born in Offenbach, German, was in the "pulp" business. The childless couple maintained a country home in Babylon, New York. It was described by the industry journal Paper as "one of the show places of Long Island." In 1912 Frederick Bertuch & Co. was dissolved and Bertuch essentially retired. He did, however, remain a "special partner" in the successor firm founded by his former partner, Johannes Andersen. The Bertuchs hired contractors to repair their roof in 1919. Whatever the problem was it was serious enough that it could not wait until summer. On the morning after Christmas Day 40-year old William Proder was among the workers high above West End Avenue. He lost his footing and fell to the sidewalk. His death was instantaneous. Frederick Bertuch seems to have been obsessed with how to distribute his estate following his death. He executed his will on May 26, 1915, then amended it three times, adding and removing beneficiaries and causes. A few of his decisions seemed capricious and questionable. The original will, for instance, left money to certain employees of his firm. In February 1921 he revoked those bequests. At the same time he added funds to maintain a bread line at the Bowery Mission and Young Men's Home. Perhaps most disturbing was the direction that Morris Gintzler, one of his executors, chloroform all of his horses "to ensure that they will not be cruelly treated." Luckily for the animals, Bertuch reversed that decision in his final codicil. Bertuch died in the summer of 1922. Minnie received $10,000 outright, the "use of his household goods, works of art and other contents of the Bertuch homes in West End Avenue and in Babylon." The will directed that following Minnie's death the houses were to be sold. The $1 million estate was spread among worthy recipients. Columbia University received $100,000, $50,000 went to Cooper Union, and another $50,000 to the Children's Aid Society, for instance. Minnie remained in the corner mansion until her death in April 1928. In the meantime, the West 102nd Street house had been a boarding house since, at least, the turn of the century. Its respectable boarders included two unmarried school teachers in the first years of the century, and, in 1911, Henry Cohn who started the Jacob Wechsler Hat Company "to manufacture ladies' and misses' straw and felt hats" that year with three partners. Shortly after Minnie Bertuch's death, all four of the houses were being operated as multi-family structures. The Stephenson family left No. 854 in 1920, after which rented rooms were advertised. In 1938 it was converted to what The New York Times described as "a modern apartment house" saying, "The building was a private dwelling and now contains apartments of one and one-half to two and one-half rooms." 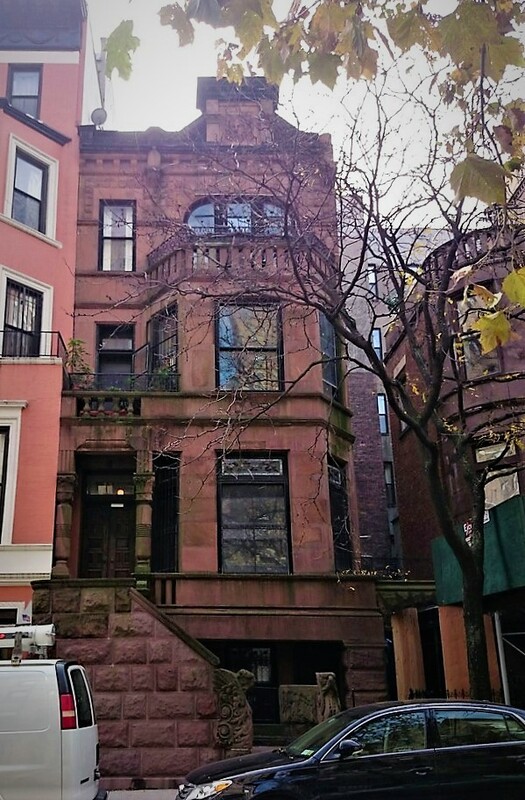 The same year that the Stephensons left West End Avenue the Katz family moved out of No. 856. Occupants living here in the 1920s and '30s had German surnames--Gabriel Hamburger, Jacob Meyer Horn, and Goldie Abramowitz, among them. In 1937 a conversion by architect Walter Katz resulted in two apartments per floor. The former Bertuch mansion contains eight apartments today; while No. 254 West 102nd Street was reconverted to a single family residence around 2007. No. 254 West 102nd Street retains its crooked stoop. Although beleaguered, Schneider & Herter's Queen Anne group still manages to command attention. The houses are a reminder of a time when West End Avenue drew well-to-do homeowners and architects rejected convention. How nice to have the picture of the West End houses with their original stoops and 254 102nd in its original design. Minnie Bradford Bertuch was my great-Aunt. So nice to see these pictures of her home.